The development of the cluster takes place together with the growth of the buds, generally between May and early June, according to the latitude and the climatic conditions (mild temperatures, good sunlight and a light wind are preferable for pollination). The flowers of the grapevine are hermaphroditic and therefore cross-pollination takes place thanks also to wind and insects. The flowering on the plant lasts about 10-20 days, according to the climate and the environmental factors, and on the single bunch it lasts about 4-8 days. 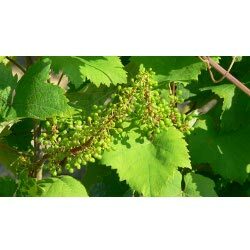 Only 15-20% of the flowers turn into fruit (grape) between late June and early July. In this phase which is subject to a form of self-regulation of the plant that in this way preserves its nutritional supply, the remaining flowers fall or turn into tendrils. Manzoni Bianco 6.0.13 has an average precocious flowering, even if it is subject to appreciable variations according to the different vintages.